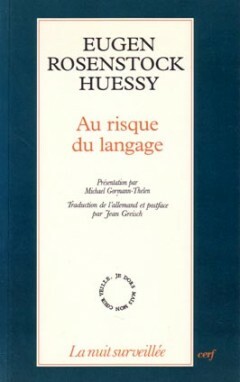 In France, Les Editions du Cerf, Paris, published a French translation of Zurück in das Wagnis der Sprache, Au risque du langage, in 1997. It is in paperback and 160 pages long. In addition to the title piece, it will contain “Datives Denken” from Heilkraft und Wahrheit and “Jacob Grimms Sprachlosigheit” from Das Geheimnis der Universität. Les Editions du Cerf is on the internet under http://www.editionsducerf.fr/home.asp.